I slept for about twelve hours last night and feel a little better today, but still not fully there yet. Lisa kept working on things yesterday after telling me to go to bed. 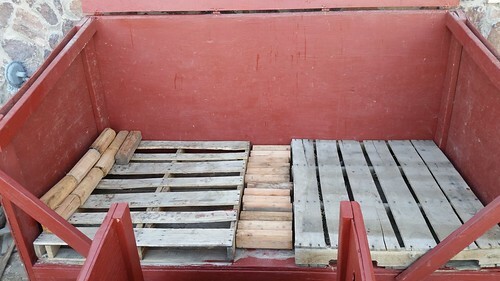 Two days ago, we got both of the pallets we'll be using to line the bottom of the wood box and keep most wood off the floor, allowing air circulation and drainage. Because two pallets are not as wide as the box, we used a row of the "fence post" wood. Big R used to sell pallets of these before switching to the North Idaho Energy Logs, and we still have some of them on hand. Unlike the energy logs, the fence-posts (we assumed that they were the remnants from actual fence posts) don't dissolve in water. We'll put these around the edges of the box as well, in case water comes in from the sides. Lisa cut and put together the removable roof for the small wood box that will go on the porch. The roof is cut from a section of the old large wood box roof. She's primed it with sanding sealer in preparation for painting. Once we get the portion of the front porch where the small wood box will go repainted, we'll be able to move the box to the porch, probably just in time for needing to use it if the thermometer continues the current trend. 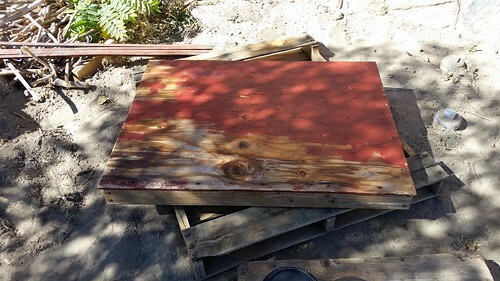 Then we can clean out accumulated hard-water gunk from the swamp cooler, probably repaint the inside bottom (lest it rust out), and put it away for the winter. Today, however, I simply want to sleep as soon as I can sign out from Day Jobbe.